The leaves are slowly beginning to change colors around Oxtongue River in Algonquin Provincial Park in Ontario, Canada as Autumn creeps in. Sticks and logs build up in the Oxtongue River in Algonquin Provincial Park in Ontario, Canada which is probably the workmanship of a beaver. The Oxtongue River is located along the Whiskey Rapids Trail in the park where you are encompassed by wilderness and peacefulness. Oxtongue River along the Whiskey Rapids Trail, Algonquin Provincial Park, Ontario, Canada. 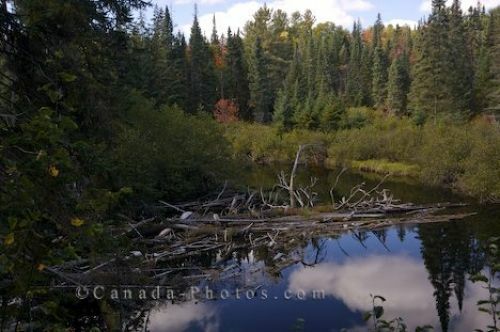 Picture of the wilderness that surrounds the Oxtongue River in Algonquin Provincial Park in Ontario, Canada.